Friday night in Head Rambles Manor can be very fractious. The battle starts at around seven in the evening and can lead to a lot of bloodshed, though rarely does it involve ambulances. The victor gets the remote control for the television. You see, Friday night is the night the Late Late Show is on, and Herself loves it. This is yet another aspect of the female psyche that I don’t understand. Herself hates Pat The Plank with a passion, yet she still wants to watch. I hate Pat The Plank with a passion and would rather watch the test card. Test cards are more interesting, more animated and have a much better sense of humour. After some relatively minor cuts and abrasions, Herself won last night and we were condemned to watch. I would have gone down to the pub, but Friday night is the night Death Watch Beetle goes for his weekly pint and I cannot stand the bloke. The programme started, and I waited for The Plank to make his smarmy entrance, but he didn’t. 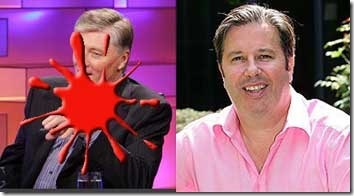 Instead, out popped Gerry Ryan. I like Gerry as a person, though I’m not a fan of his on radio. His forays into television in the past have been a bit of a disaster too, so I perked up to see what kind of a mess he’d make of the Late Late. The guests left a lot to be desired, but then they were probably picked for The Plank and not for Gerry. We started with Tony Curtis, who looked like he had been wheeled out of his oxygen tent for the interview. Gerry was a little at sea with that one. Then there was Roseanne Barr who used to look like Mary Harney but now looks like a woman. We had to wade through an interview with Daniel O’Donnell. If that bloke talked any slower, he’d be talking backwards. Tommy Tiernan came on and Gerry lit up. Mayhem ensued and Tiernan made it blatantly obvious that he was much happier to be interviewed by Gerry that The Plank. The show rounded off with Gerry phoning a woman down the country. He spoke to the husband first but couldn’t understand the bloke. When he finally got to speak with the woman, he asked her if she was married to an Eastern European. That was a bit of a gaff, as he was from West Cork. This flustered Gerry a bit and he happily awarded a prize of a holiday to the woman while forgetting to ask her to answer the qualifying general knowledge question. Classic! It would be virtually impossible for Gerry to be worse that The Plank, and he wasn’t. He was a hundred times better. But then it’s easy to be a hundred times better than The Plank. Oh dear – your TV sounds worse than ours!!! And that takes some beating! I almost wish I’d watched it, now. But Gerry seems to be everywhere these days, news, book, radio, blah. Is he taking over as part of this dictatorship plan of Thrifty’s, or what? Kate – We get yours as well, don’t forget. Belive me, RTE is worse. Five hundred channels of sheer banality. The only channels I watch regularly are BBC and ITV. Susan – I’m a bit sick of that book of his all right. However, last night he managed to breathe a little life into a long dead show which was quite a feat. I switched off when I saw Tony Curtis. I feared incontinence would set in – his, not mine. Over to Jonathan Ross later on? Tony Curtis again. It seems we underestimated the man. He has teleportative skills. I gave up again and put on The West Wing. Then I went to bed. I hate them both vigorously too, but Gerry is the better of two bags of turds. Radge – He looked like incontinence was the least of his problems. Bed was probably a good choice. Maxi – Whatever about is failings, Gerry at least can understand the concept of humour. Plank drives me mad with that inane ‘Hah. Hah.’ that he mutters when he realises that someone may have cracked a joke. Tiernan was rubbish. He is not clever enough to do black humour, his remarks about the National Rehabilitation Hospital just came over as bad taste. Apart from the news, I don’t watch RTE at all – I just happened to be in the kitchen when the programme was on. It’s an awful format. Ian – I agree. He was trying much too hard to be funny and it just came across as desperation. The whole program had a pretty high cringe factor, BUT it was still infinitely preferable to The Plank. Ashamed to admit it but I was watching this last night. And Gerry Ryan did surprise me at how watchable he was. Although it was The Late Late Show, he brought his own character to it. The crowd loved him, he asked questions the guests seemed to enjoy answering and overall it never seemed as rigid or planned as a Pat Kenny show. It was by no means the perfect performance from Ryan, but it is certainly more promising than his previous attempts. Regarding Tommy Tiernan, he really has lost everything that made him a success. In his first video he had a joke about a donkey committing suicide. In telling this joke he made a particular noise to mimic the donkey. It was very funny at the time. However he has gone on to re-use this exact same noise, in different jokes since then. And there is also the obligatory joke that crosses the line, last night it was the National Rehabilitation Centre and the travelling community, previously it was the Special Olympics and The Church. Its as if crossing the line means he is instantly funny. Many comedians cross the line, but they do so in a clever manner which can be appreciated. Gary – We all have little secrets that we are ashamed of. That pretty well sums up the program. It was a bit of a mess, but I’d prefer a bit of a mess to the starched poker-faced usual. Parochialism notwithstanding . .you could play Guitar Hero? Version four comes out tomorrow! Guitar Hero is the best waste of time ever invented. That’s what. I can’t believe how easy you were on our wee Daniel. He’s Ireland’s punchbag! Bless his wee little cotton socks.